Do you have the service book? 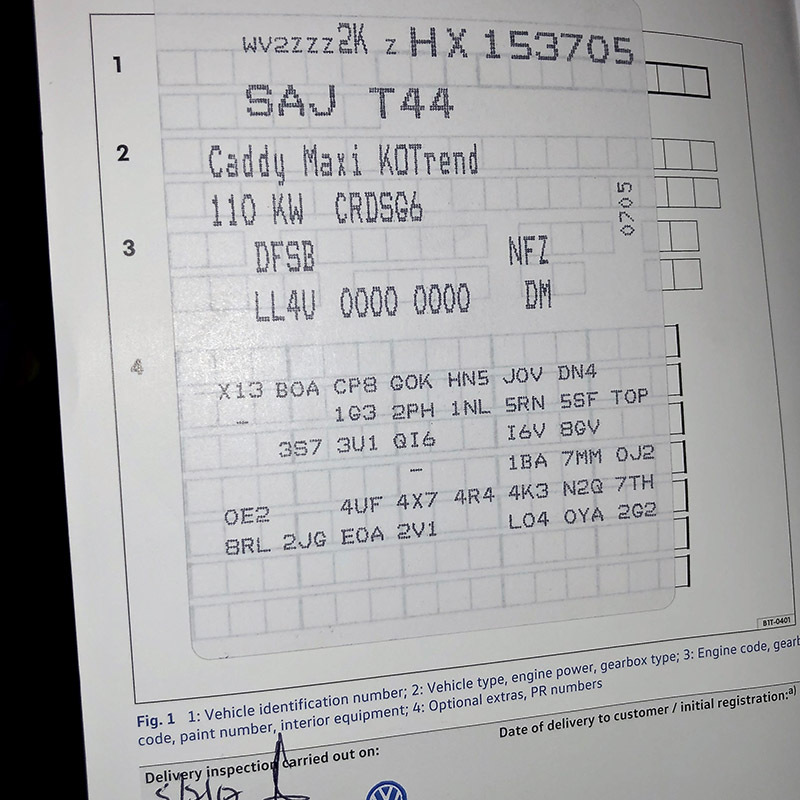 If so, look inside the front cover, and next to item 3, your engine code is printed. For example, I've attached mine and you can see that in my 2017 150TDI Maxi Life, I have a "DFSB". Once you have your engine code, you could cross reference which other VAG vehicles have that same one, and then go looking for a suitable engine cover. Mine isn’t Bluemotion but does require AdBlue as per EU6 - at least if you have the engine code you could find a part number hopefully. No problem. VW and/or TPS will say that of course because that part is not available on a Caddy - computer says no... I got mine on eBay, it came from a Golf mk7 in a breakers yard in mint condition. So once you’ve found a VAG car with that engine code, grab the part number and look on eBay or order it new. Hopefully someone on here with that engine code will help?? The engine/manifold cover part number you want for the CFHC engine is 03L 103 925R and you will also require 2 x 03L 103 164 ball head mounting posts (The back two engine/manifold cover ball head mounting posts should be already present on the vehicle) and also/maybe 1 x O3L 133 287 o-ring but not really necessary, well I did not bother anyway as its only the oil filler neck rubber seal between the filler neck and the engine cover. Last edited by Bionicman on Mon Feb 04, 2019 11:40 am, edited 2 times in total.